The following page is a visual introduction to Dokdo Island’s most proximal fishing communities to help the readers to familiarize themselves with the Dokdo region. Dokdo Island is also called Liancourt Rocks or Takeshima by Japan. 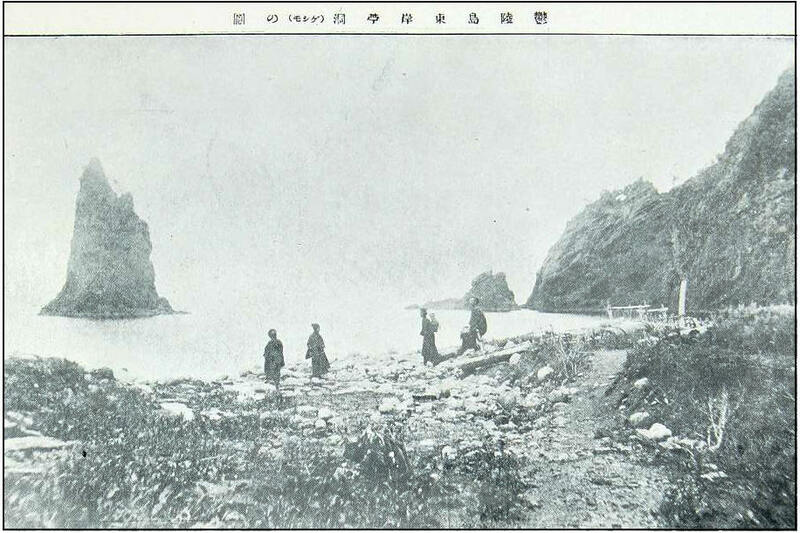 This article has images of Korea’s Ulleungdo Island from the early 20th Century. This should give readers an understanding of Koreaa’s economic interest in the Dokdo – Takeshima area at the time of Japan’s 1905 annexation of Dokdo, versus the situation in the vicinity now. Above this text are two maps. The image to the left is an overall map of the entire East Sea (Sea of Japan). This map shows the distances from Dokdo to the nearest Japanese and Korean islands. On the right there is a map of Ulleugdo Island. 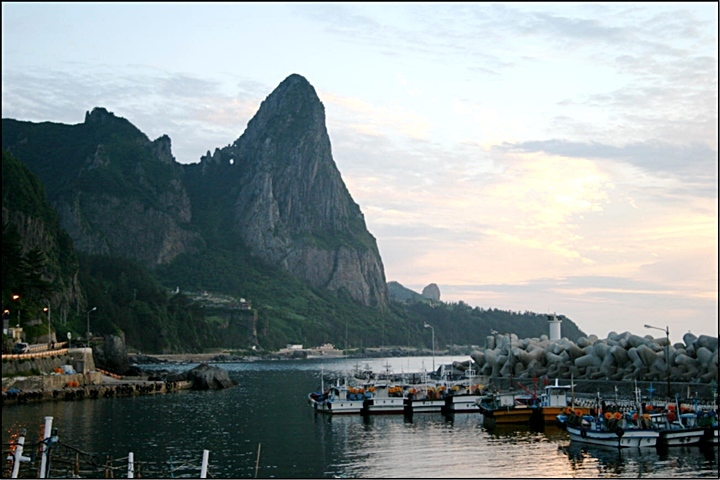 It’s common knowledge Korea’s Ulleungdo Island is Dokdo’s most proximate island. 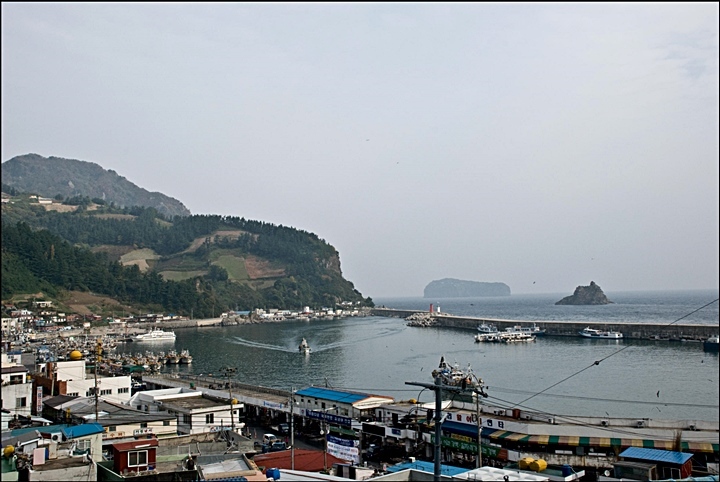 Four of Dokdo’s closest fishing ports are on Korea’s Ulleungdo island. They are Hyeonpo, Sadong, Jeodong and Dodong Harbours. All of these communities, in one way or another depend on the waters surrounding Ulleungdo and Dokdo for their livelihood. 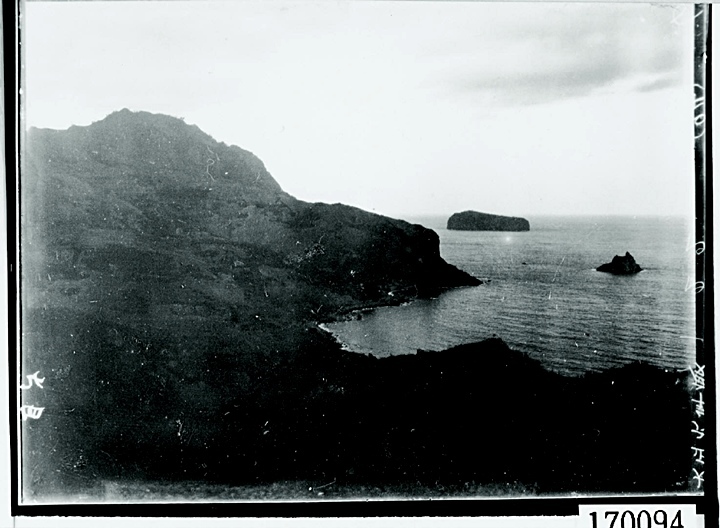 What was the fishing and economic situation in the Dokdo Takeshima region in 1905? Well before 1905, when Japan forcibly annexed Dokdo Island (link), Korea and Ulleungdo were very different places. 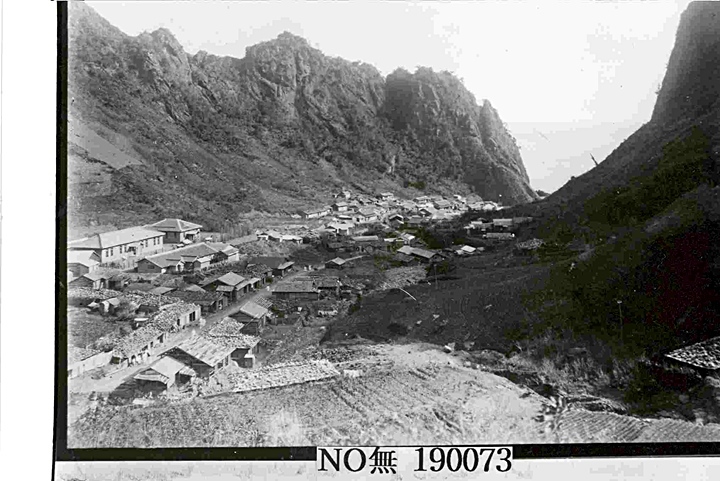 Almost all aspects of Korean life on Ulleungdo were controlled by Japanese. This was especially true with regard to fishing in the area. 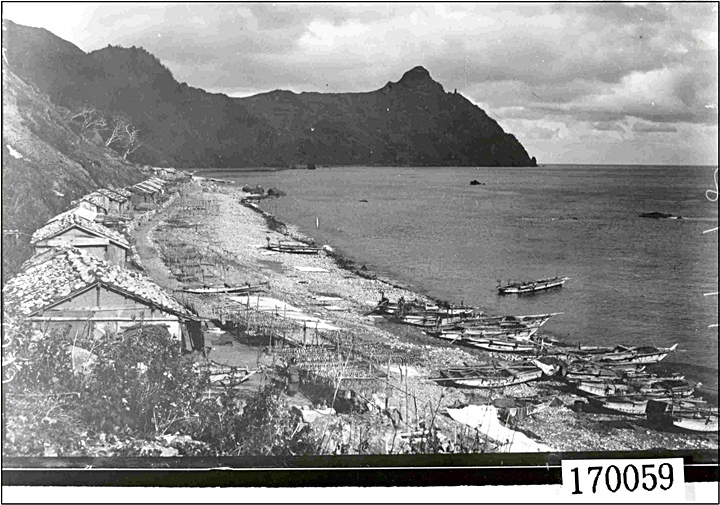 In the early 20th Century, The number of illegal Japanese fishing on and around Korea’s Ulleungdo Island would increase to 1,000 people. 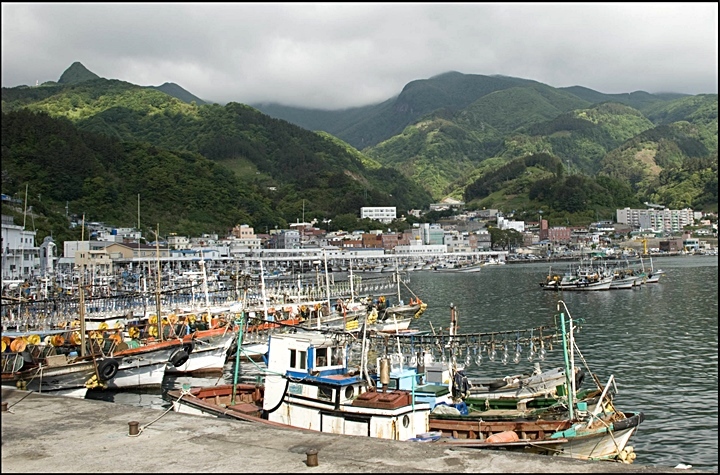 (link) Thus, Korean fishing was less developed than that of the Japanese trespassers on Ulleungdo. 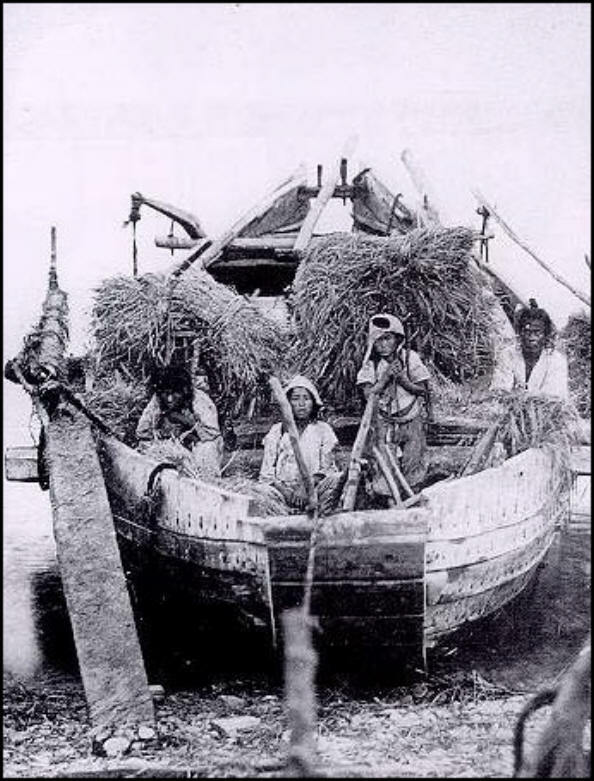 However, these days Korea’s modern fishing industry in the East Sea (Sea of Japan) has of course modernized to a level that now equals her Japanese counterparts. Then and now: These images above show Jeodong’s North side. 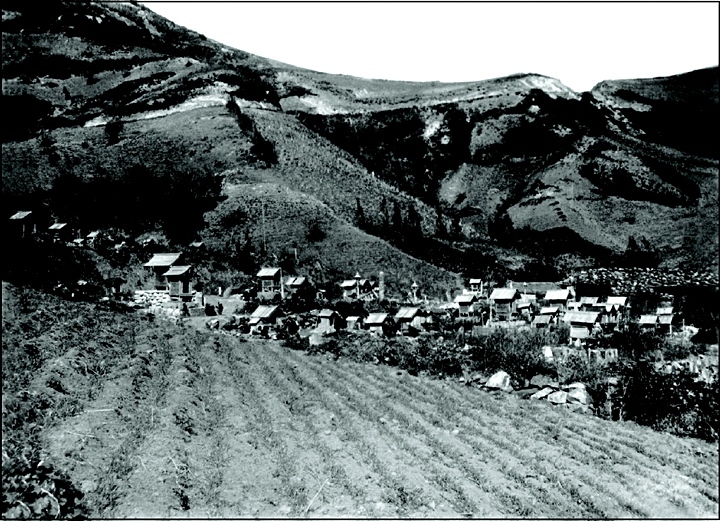 The above left was taken in the early 20th Century and to the right is Jeodong today. In the background of each photo Buk Jeo Rock and further North is Jukdo Islet about 3kms away. 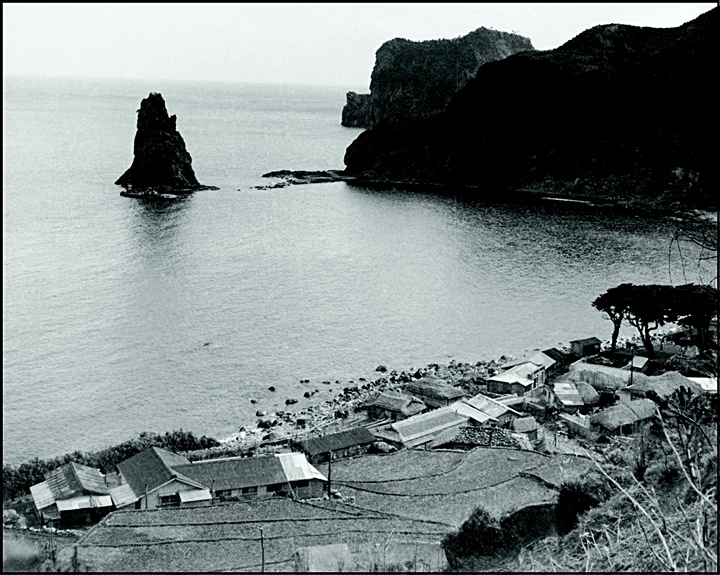 As we see, Ulleungdo’s Jeondong, like the rest of Korea itself has changed incredibly over the last century. 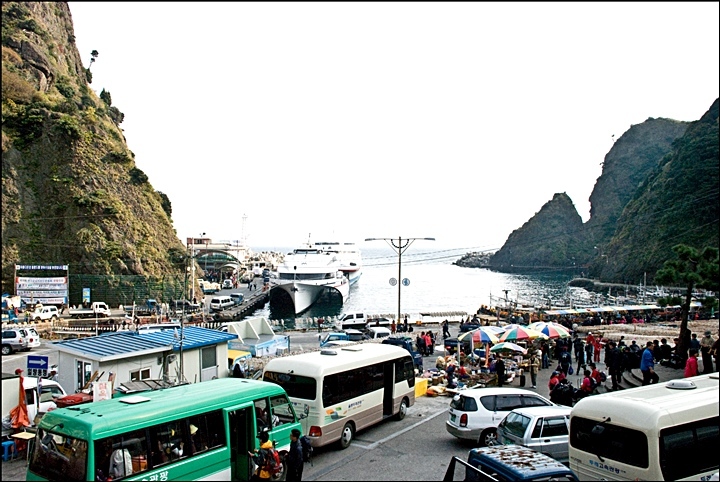 Jeodong Harbour is now home base to Ulleungdo’s largest fleet of squid fishing boats. What was once a rocky beach has been developed into extensive cement docking facilities. Also visible is the large concrete breakwater that protects Jeodong Harbour from the East Sea’s frequent storms. These days Jeodong’s shores are lined with restaurants, hotels, shops, and a factory that makes ice for preserving fish. Further away newer multi-storey apartments are home to local shopkeepers and fishermen. These have long since replaced traditional Korean thatched-roof homes on Ulleungdo. 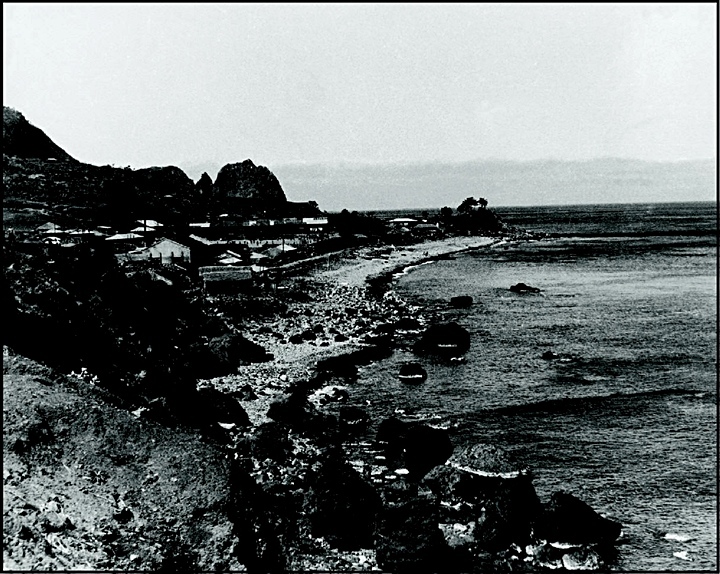 The images above are of Jeodong’s South shore in the early 20th Century and today taken from the same location. 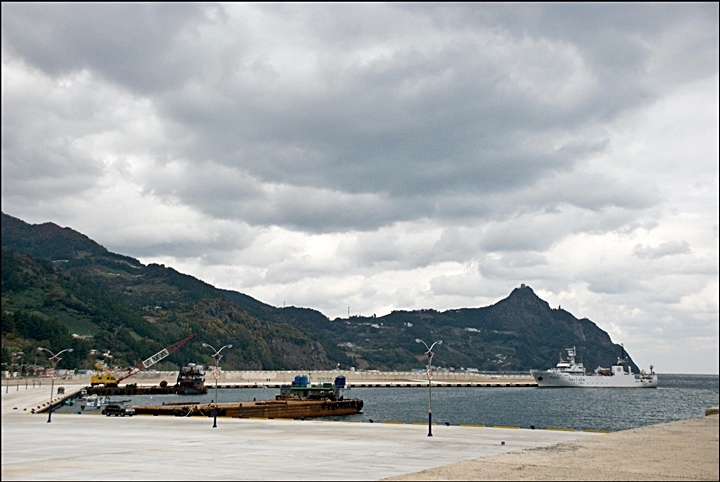 Below images are of modern Jeodong Harbour on Korea’s Ulleungdo. 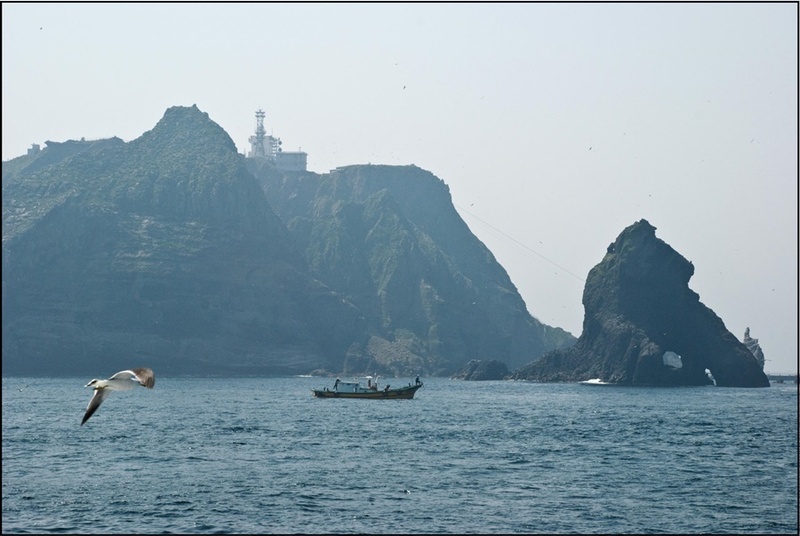 This is Dokdo’s nearest fishing community and home for large fleets of Korean fishing vessels. There is now a breakwater, concrete mooring, apartments, and numerous businesses lining the shores of Jeodong. Korean houses with wooden shingles at Dodong Harbour. To the above right, Japanese prayer altars show the infleunce of Japan’s residents on Korea’s Ulleungdo Island. Above left shows the bustle of everyday Dodong Harbour these days. 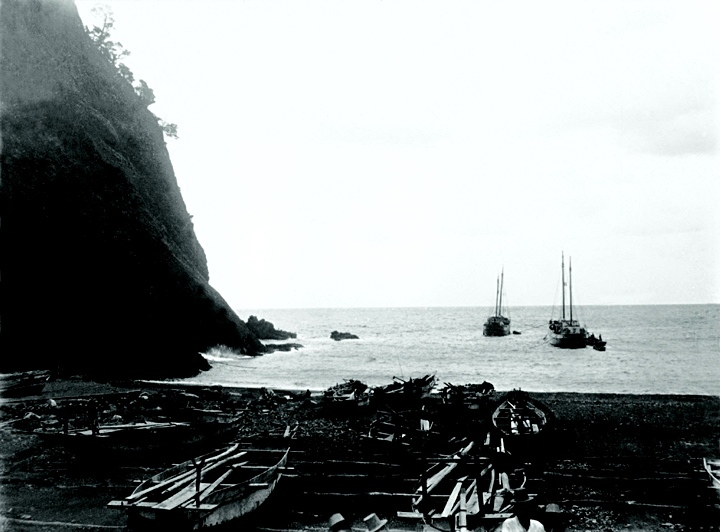 To the right, an early 20th Century photo shows Japanese boats moored at Ulleungdo’s Dodong Harbour. Notice there is no dock but rather a stony beach. Looking closely at the photo above right, it appears Japanese military personnel are standing next to the large rowboat. 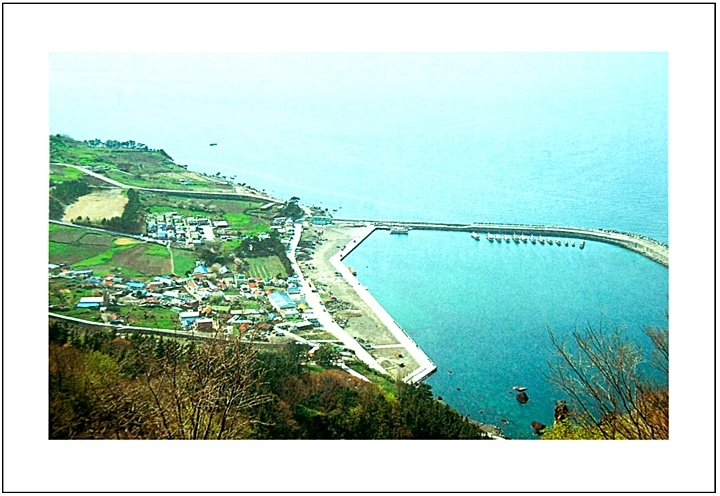 Photos taken from the hills above Ulleungdo’s Dodong Harbour. The buildings show the influence of Japanese architecture. 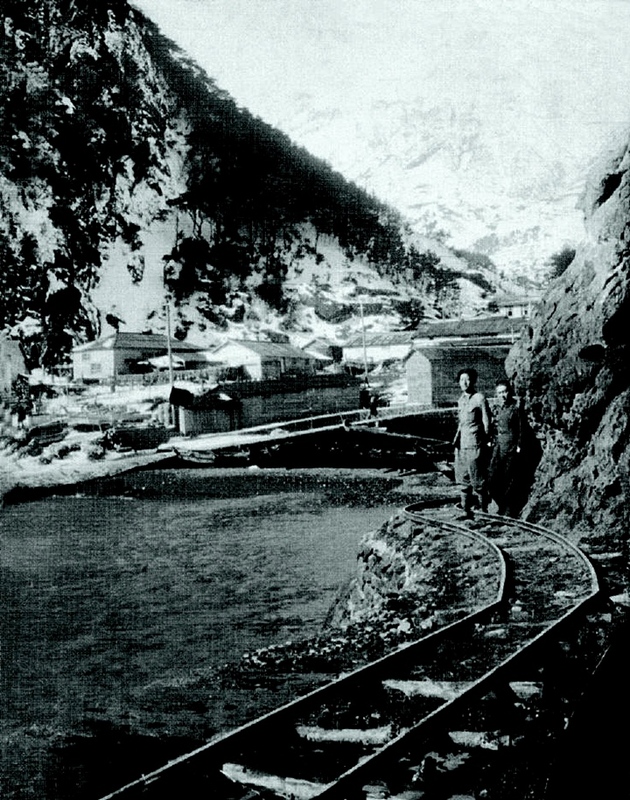 Below right is a photograph of Dodong’s crude rail line used to shuttle resources from Ulleungdo such as lumber. 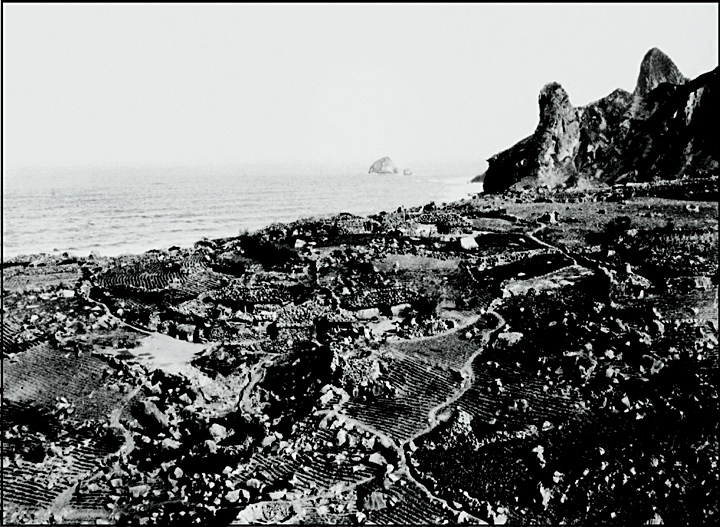 Needless to say, at the turn of the 20th Century there was no tourism industry on either Ulleungdo or Dokdo Island. However as these modern images show, Korea has built a thriving industry on both of these islands. Dodong Harbour is the center of all these activities with hotels, restaurants and clubs that cater to Koreans and a few adventurous foreigner who venture there. 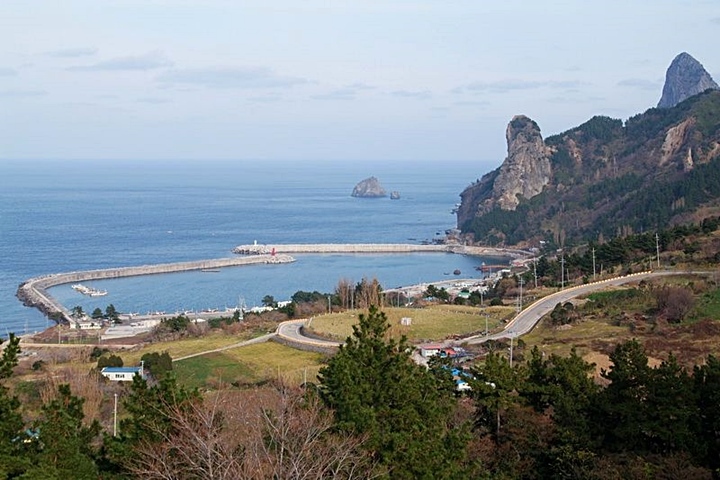 Over the last years, restrictions on visitors going to Dokdo from Ulleungdo have loosened and this has created a new branch of tourism in itself. It’s worthy to note, because Dokdo Island is so far from Japan’s Oki Islands, it’s highly doubtful Japan could ever utilize Dokdo in such a capacity. Currently, voyaging to Dokdo from Ulleungdo is about a half day return. Tourism to Dokdo, even from the most proximal islands, the Okinoshimas (at 157kms) would be both impractical and uneconomical for Japan. Modern Dodong on Ulleungdo. High speed speedboats shuttle residents to and from Korea’s Pohang and Donghae Cities. The port is lined with dozens of hotels, restaurants and businesses. 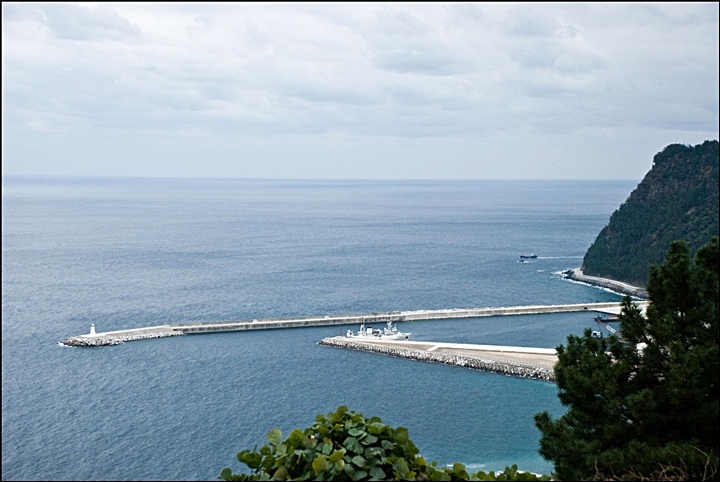 Ulleungdo’s Dodong Harbour is also home for Korean fishing vessels. Today, Dodong Harbour is still the administrative capital of Ulleung Gun. 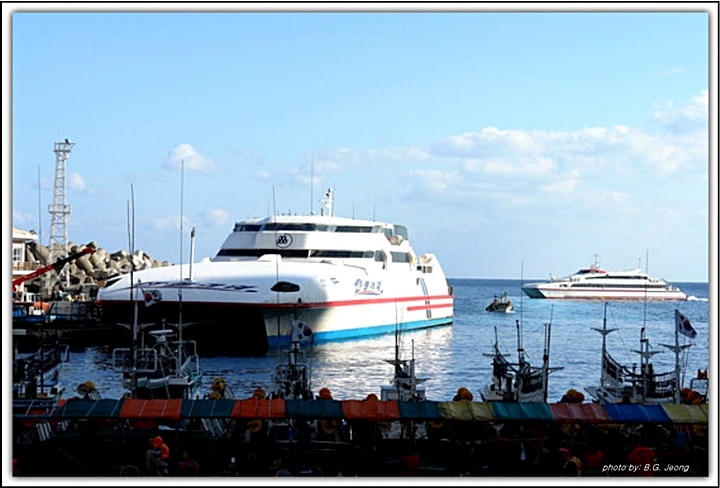 Dodong is a very busy port that now bustles with both tourist and fishing vessels. High speed passenger boats shuttle passengers to and from Pohang, and Donghae Harbours on the Korean mainland. Tourist ferry boats also sail daily to Dokdo Island from Dodong weather permitting. 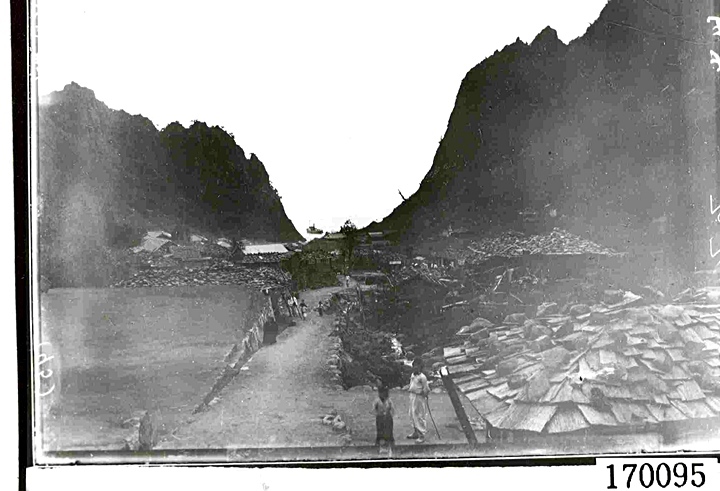 Dodong Harbour’s valley, once lined with primitive Korean huts now has dozens of multi-storey hotels, restaurants, and clubs for Ulleungdo’s many tourists. 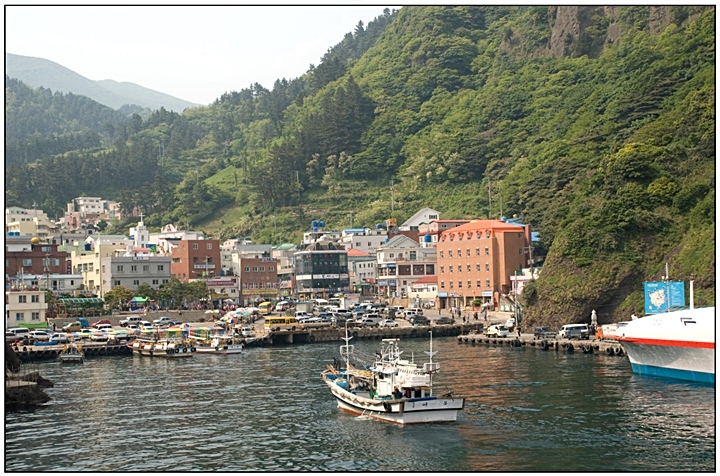 In the hills above the harbour are government administrative offices, and the Ulleungdo-Dokdo museums. 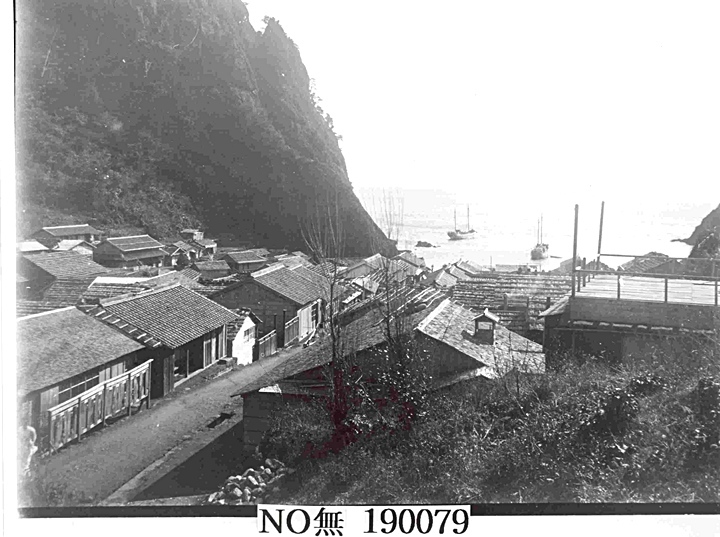 In old photos, the Hyeonpo and Cheonbu Harbour areas appeared to be mostly agricultural zones of Ulleungdo. In the pictures below, the landscape seems quite rocky. Tiered rice fields appear to be the source of food and no trace of fishermen can be seen in any of the photos. In the background are No-In Mountain and further beyond, Song-Got Mountain. A little way offshore, are Elephant (Hole) Rock and Sujung Rock. If we look closely we can see simple Korean huts of straw with rock-covered, wood-shingled roofs. It must have been very difficult to eke out an existence farming in this barren, rocky terrain. 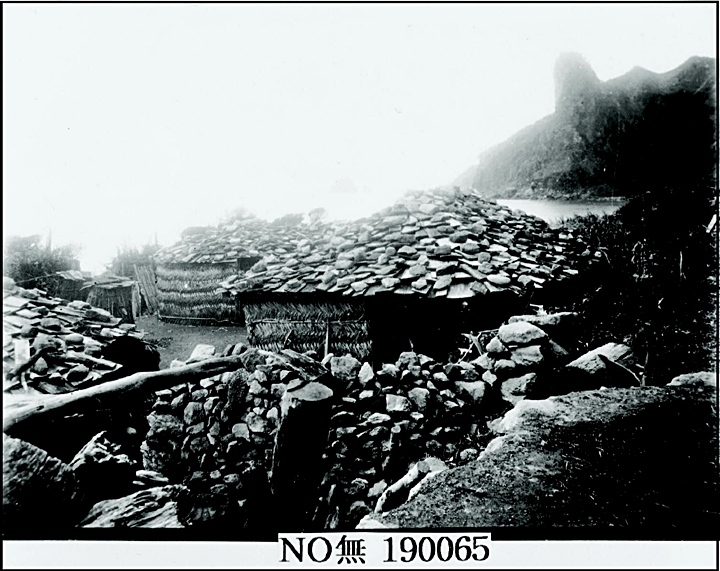 Early 20th Century Hyeonpo Harbour was really little more than a rocky village on a beach. Korean straw huts in the shadow of No-In Bong Rock. These photos are separated by a century yet only meters apart. 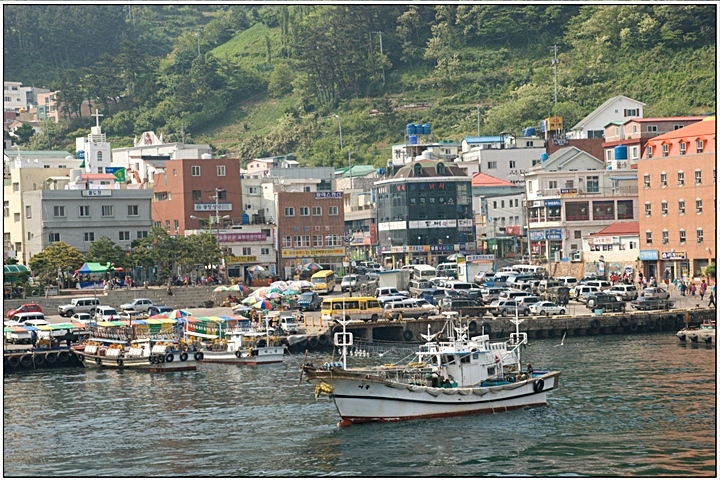 This visual comparison highlights the development of Ulleungdo’s North shore. To the left is a modern photo of Hyeonpo Harbour showing the modern concrete breakwater, In the background are Elephant Rock, No-In Bong and Song-Got Bong. 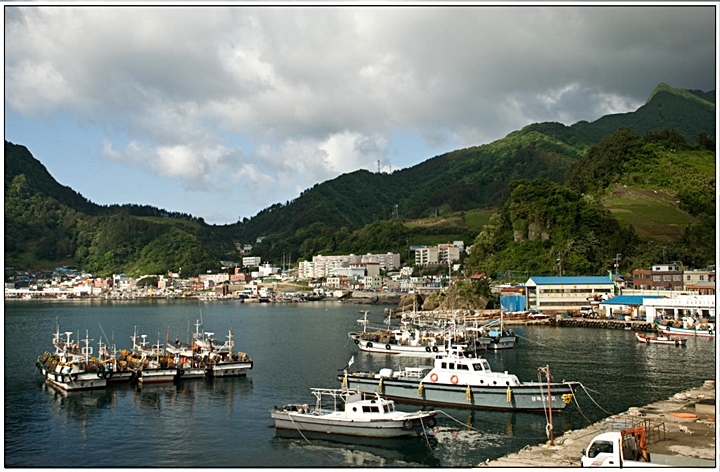 Today, Hyeonpo Harbour is one of two fishing communities on Ulleungdo’s North shore. Hyeonpo now has mooring for fishing fleets and a large breakwater has been built to protect boats during heavy seas. There appears to be little agriculture near Hyeonpo Harbour. Cheonbu Harbour to the East, much like Hyeonpo, now has a long cement breakwater and mooring. Ulluengdo’s North shore attracts many tourists for the clean beaches and breathtaking scenery. The photos on this page are interesting images to browse through but they prove a point. Their main intention is to show readers how the Ulleungdo – Dokdo region and fishing industry have modernized since the early 20th Century. Long gone are the primitive straw Korean huts. Also gone are the crude row boats used by Ulleungdo’s fishermen which were mostly confined to proximal waters. It’s apparent the Koreans have naturally developed their fishing industry to modern standards equal to that of the Japanese. 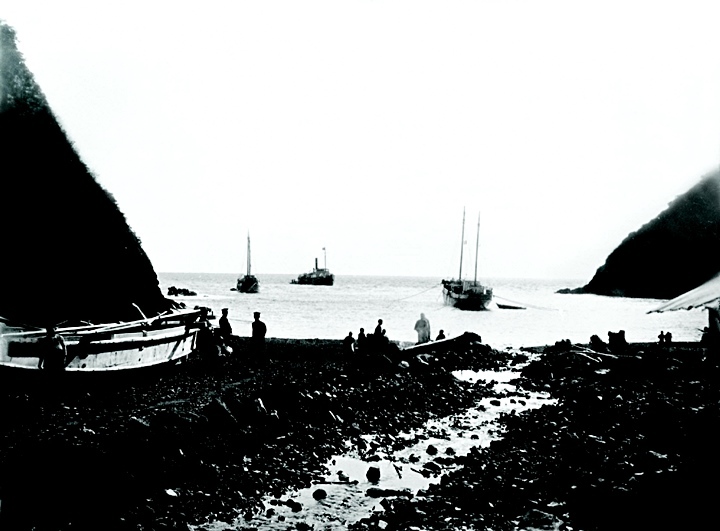 For early 20th century fishermen on Ulleungdo, a voyage to Dokdo would have taken the better part of a day and this was only done seasonally. While today, Korean fishing and tourist vessels make this trip in a couple of hours, any time of year. 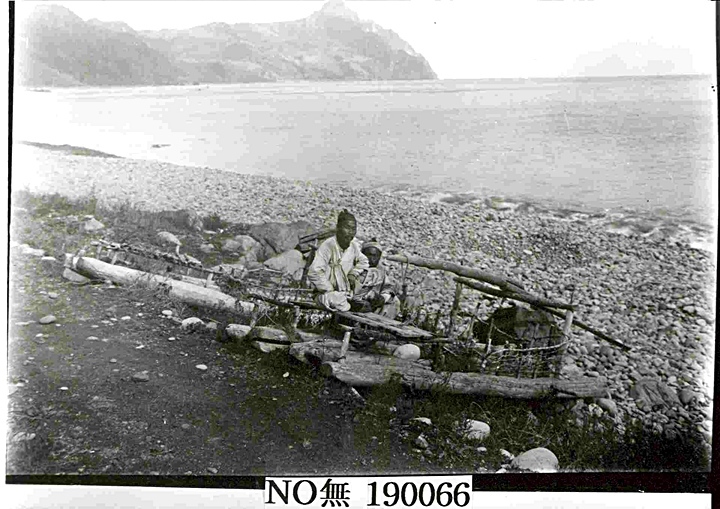 Above left shows Korean men standing near a raft used to harvest Ulleungdo’s shoreline marine resources such as laver and shellfish. Above right shows the new Sadong Harbour lined with huge columns of cement tetrapods as viewed from the mountains above. Sadong’s new harbour is said to be almost completed. Top left a ground level view of Sadong’s massive concrete docking facilities. The Korean fishermen above were from Geomundo. For decades these hearty fishermen braved the 500km voyage to the Ulleungdo region every spring to harvest Ulleungdo’s rich marine resources and to build boats on the island. 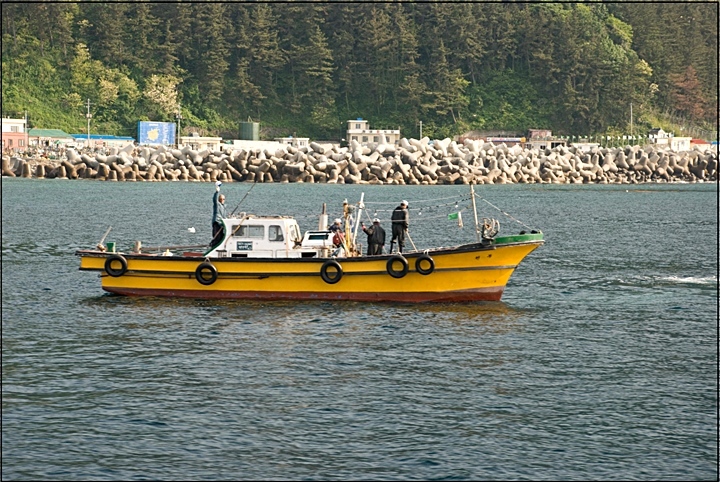 Above left: Modern Korean fishermen near Ulleungdo’s Cheonbu Harbour wave to tourists. Above right: Korean fishermen from Ulleugdo’s Dodong Harbour fish next to Dokdo’s East Islet. 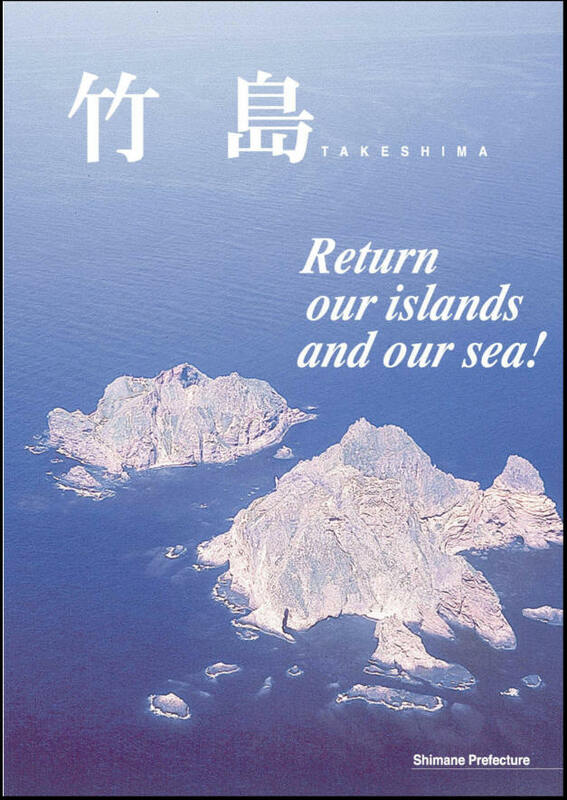 Reading Japan’s Shimane Prefecture Takeshima brochure they make the outrageous demand to have “their sea” returned to them. Were the seas near Dokdo historically Japanese? Japan’s Shimane Prefecture does have a point. Japan did have unrestricted access to the waters of the East Sea (Sea of Japan) around the time Japan annexed Liancourt Rocks. However, historical records show how Japan secured control over these waters and explain why their claims are antiquated. 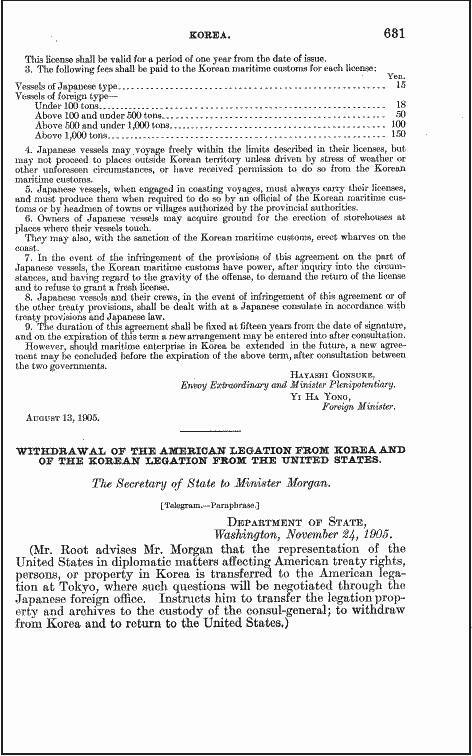 Two treaties from the Meiji Era, The Ganghwa Treaty of 1876 and an amended 1905 Japan Korea Agreement reveal how Japan came to “acquire” the right to voyage into Ulleungdo’s and Korean’s territorial waters. The Gangwha Treaty (link) was Japan’s “foot in the door” and would pave the way for Japanese inroads toward the annexation of the entire Korean peninsula. Japan managed to secure access to Korean waters through her version of gunboat diplomacy and threats of military invasion if denied these rights. 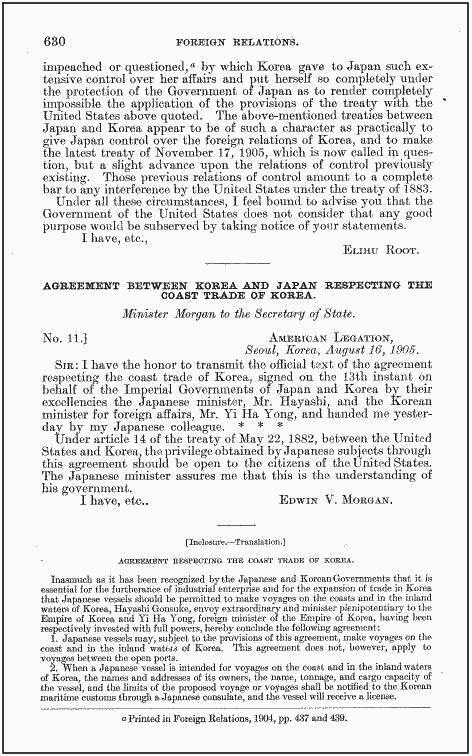 Articles 6 and 7 from the 1876 Ganghwa Treaty allowed Japanese naval and commercial vessels to survey Korean waters at will. It also gave Japanese ships the right to travel to Korean coastal areas and ports. Above left: Shimane Prefecture’s brochure insists they have “their sea” returned to them. 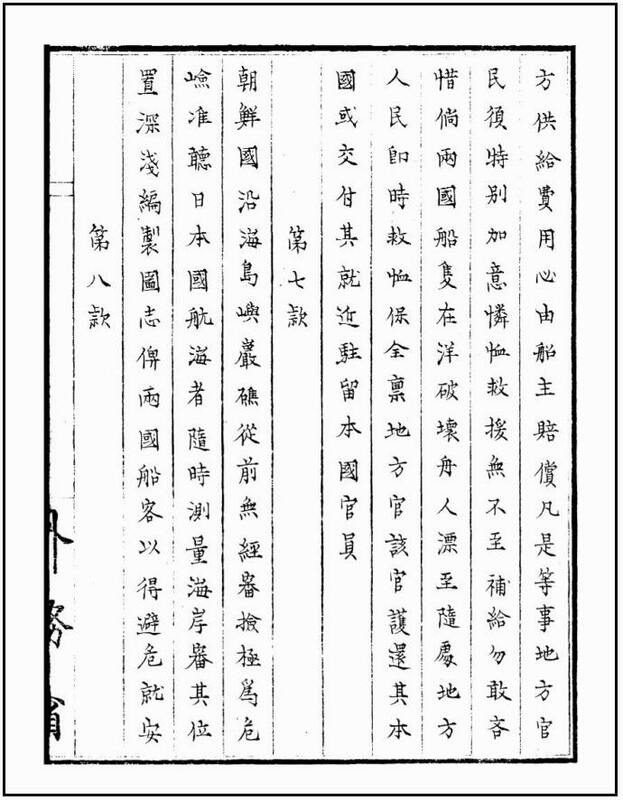 Above center and right: The 1876 Ganghwa Treaty opened Korea’s surrounding sea and coastal waters to Japanese naval and commercial ships. Japan “aquired” these voyaging rights under the threat of military invasion. Decades later we can see the original records of recently concluded Japan Korea Agreement. These were also a result of threats and coercion made against Korea during Japan’s military occupation of Seoul at the onset of the Russo-Japanese War of 1904-1905. (link) This treaty was signed as Japanese troops occupied strategic areas of Korea. It was just months after the Japanese had annesed Dokdo and defeated the Russians in the Battle of Tsushima. This agreement also reaffirmed that Japanese vessels could voyage freely in Korean coastal and inland waters. 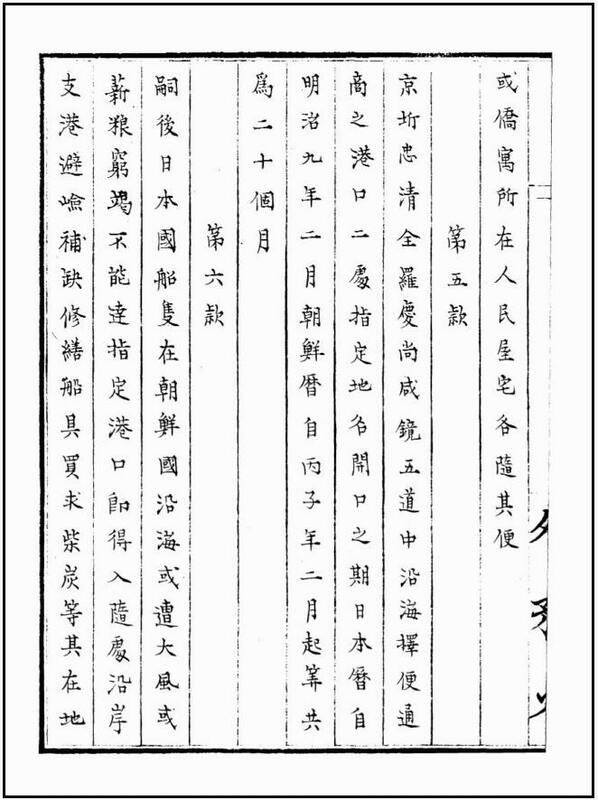 Above images from U.S. Foreign Affairs Records recording Japan’s right to freely voyage into Korean coastal and inland waters in August 1905. There are pages on this website that show Japan historically both excluded Dokdo Takeshima from her territory and also thought the islets were Korean. However, it’s time to take another approach toward solving the Dokdo Takeshima issue that involves moving past the futile historical debate. 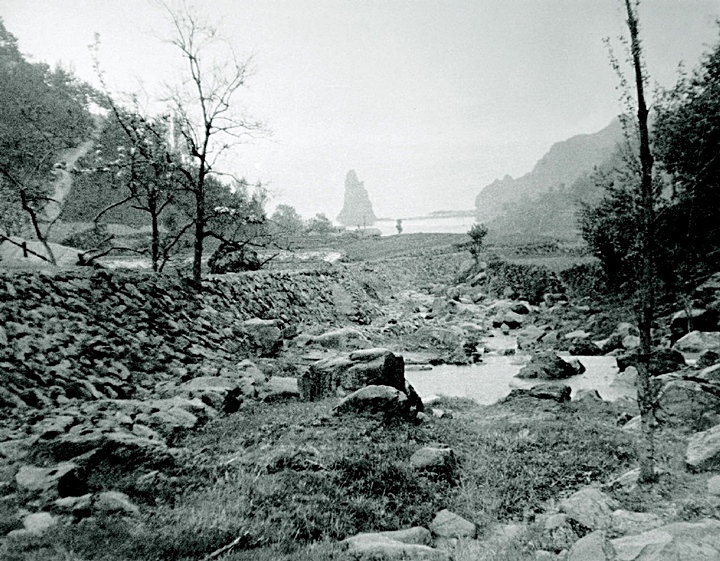 The waters surrounding Korea’s Ulleungdo are no longer under the sphere of Japanese influence, therefore the limits of Japan-Korean territory cannot be defined by the circumstances of 1905. 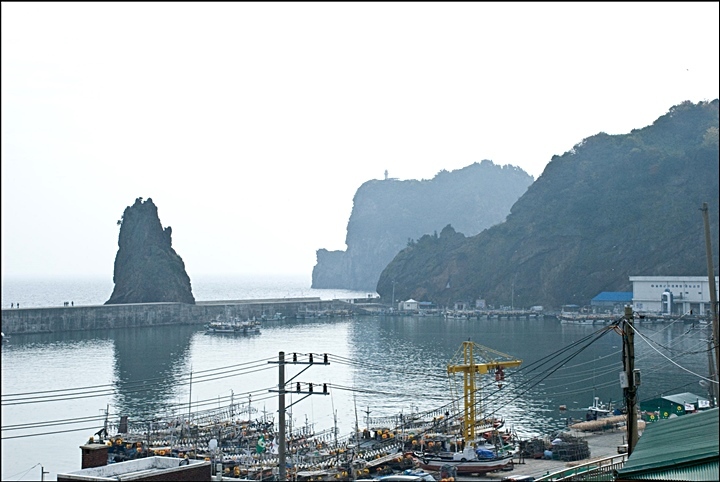 The fishermen of Korea’s Ulleungdo should not be punished for having the good fortune of being Dokdo’s nearest island. They should be rewarded, meaning they must be treated as equitably as the fishermen of Japan’s Oki Islands. In other words, Korea’s Ulleungdo should be granted at least the same amount of ocean to call their own. Naturally this would place Dokdo within Korea’s territory. Knowing the reality of the Dokdo region in a modern context makes it clear why it’s impossible to entertain the idea Japan can ever reclaim Dokdo Takeshima. Korea’s freedom from the Japanese yoke of colonial rule, the geographic reality of the Dokdo region, and the extensive modernizaton of Ulleungdo’s fishing and tourism industries make it inconceivable Dokdo should ever again be part of Japan. Images property of the Dokdo Museum, no unauthorized use without permission.